In a true sense software purchases at most companies are complex from an accounting sense. The purchasing process can be long and drawn out and include a number of different departments within an organization. According to Gartner's research, a typical IT purchase of enterprise software can involve five to 15 people in the decision-making process. The cloud and Software-as-a-Service (SaaS) have created new purchase options beyond traditional owned perpetual software licensing. This in turn has opened up new options when it comes to the financing models used to pay for software that buyers should consider. If you’re like me you’re probably not an accountant and may only have a basic understanding of the benefits of accounting for software investments. First and foremost is the challenge of expensing investments as an operational expense (OpEx) versus a capital expense (CapEx). As such it can be difficult to fully articulate the potential financial implications and benefits of using one or the other to account for software investments. OpEx and CapEx represent two distinct categories for expensing business expenses. Both differ in the nature of the expense and in the tax treatment for tax purposes. Let’s start with a high level definition of each. OpEx represents the costs that are included as part of your company’s profit and loss statement. That’s because operating expenses are related to expenses that will be incurred on an ongoing basis. Think about them as the on-going cost of doing business. From a tax perspective they are tax deductible in the year that they are made. This type of expense makes up the bulk of a company’s regular business cost and management is generally always trying to find a way to reduce these. CapEx, on the other hand, covers the major investments in your company and move from your income statement to the balance sheet. This is important because if the capital purchased useful life extends beyond a year it gets recorded as an asset and is then expensed using depreciation that spreads the cost over a number of years. How can a SaaS model help? SaaS is a software licensing and delivery model in which software is licensed on a subscription basis and is centrally hosted from an operational perspective. 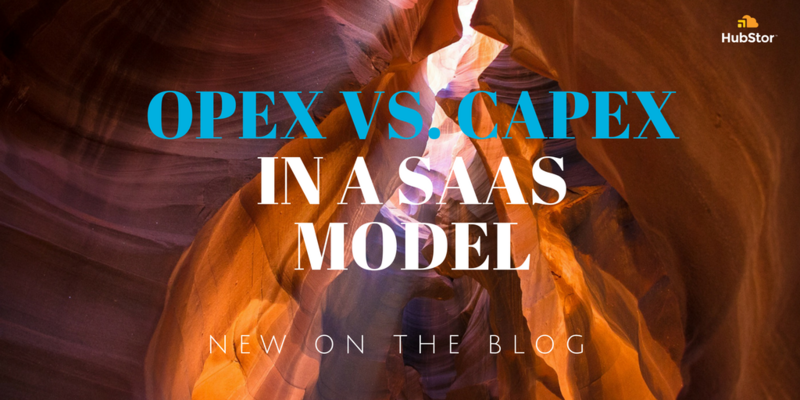 The SaaS model allows for the shifting of expenditures because items that may normally be obtained as a capital expenditure can have its cost reassigned as an operating expense. This can assist a company’s cash flow and allow the business to avoid making the whole purchase in a single year. Shifting capital expenses to operating expenses can be a smarter way for organizations to stretch their budgets – at least from an accounting standpoint. This is precisely the flexibility that SaaS allows you to achieve. Furthermore, SaaS is more than a software purchasing advantage -- it delivers significant IT infrastructure and operations benefits too. With SaaS, gone are the requirements to purchase expensive hardware or infrastructure (more CapEx) to maintain and run these software systems. Consider using your operating budget to help your organization achieve more. Remember with SaaS, no unexpected hardware failures, no patching of environments, reduced costs and fewer headaches with the whole capital expenditure process. The IT team can provide more value to the business. Talk with your accounting team to determine the true impact as accounting rules vary from country to country. DISCLAIMER: HubStor is not providing financial or accounting advice. The information contained in this blog post is just an opinion.